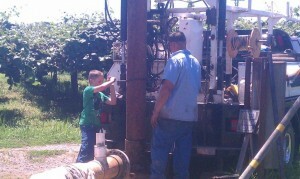 Providing exceptional well service is in our blood! Our humble beginnings started in the 1950’s when Doyle started Davis Well Drilling. He was an expert in drilling water wells, boring holes and earth auguring in our local community. Doyle later trained his son in-law, Steve Neal and passed on his expertise in well drilling and sealing of water wells the right way! Steve then decided to open up his own well drilling company in order to expand their well service to include rebuilding existing wells, putting in pumps, relining, and cleaning out wells (see more well service). Steve wanted to make their business a one stop shop. The two companies merged and coexisted as Superior Well Service. Later in 1993, Steve’s son Bryan joined the team and began learning the trade. Bryan’s father and grandfather trained him as a rig hand, and eventually he became a partner at Superior Well Service. Today, both Steve and Bryan are here to help you make decisions regarding well drilling or if you need well service. As a family owned business, we aim for you to be a satisfied customer. We are a great team and we look forward to working with you. See why so many in our community have come to trust and expect quality work from us. We guarantee you won’t be disappointed. Superior Well Service is proud to be a third generation business.